We are among the pioneers in the industry for manufacturing and supplying Mild Steel Tank to a wide clientele based across the country. The offered tank is fabricated by our diligent professionals using optimum grade materials and has high tensile strength. It is leak proof, capacious and durable. Being resistant to corrosion, chemicals and abrasion, it is extensively demanded by our clients. We are among the prominent names in the industry for manufacturing and supplying Pressure Vessel Tanks to our valued customers. The offered tanks are applicable in a wide range of industries including textiles, oil & gas, pharmaceuticals, chemicals, food processing, thermal power plants and water treatment plants. These are tolerant to high pressure environment and durable as well. 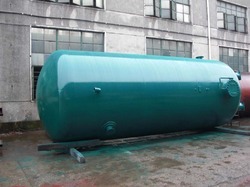 Looking for Mild Steel Tank ?